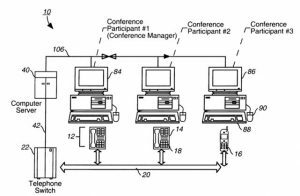 In 2000, Sony applied for a patent for its network conferencing system, attendance authentication method and presentation method. Conference calling has been in existence since 1915 when the first ceremonial transcontinental phone call took place between New York and San Francisco during the Panama-Pacific International Exposition. Not only was this the first cross-country phone call, after the initial connection was made between Alexander Graham Bell and Thomas Watson, additional dignitaries were connected to the phone call. Calls back then were cost prohibited, with a three-minute cross-country phone call costing the equivalent of nearly $500 dollars today. By the middle of the last century, Bell Labs became the first to begin experiment with group telephone calls on a more commercial basis. AT&T soon followed, exhibiting its Picturephone in 1964 at the New York World’s Fair. These early technologies remained expensive and weren’t widely used. By the 1970s, conference calling via physically bridged copper wires became more common. However, these calls could only handle about three participants before call quality suffered. In the 1980s, phone manufacturers started including basic conference calling features to their phones, again, with just a handful of participants. These systems did deliver better sound quality thanks to line balancing and amplification. Digital telecommunications revolutionized teleconferencing, adding more sophisticated conference bridges that allowed for more than a dozen participants. Today’s modern conference bridges allow for huge participant lists. As the technology that brings people together has evolved, so too have some of the features that make conference calls so helpful. For example, you’ve likely encountered live operators, chat boxes, and MP3 recordings when participating in a modern call. 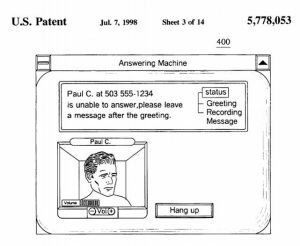 If you were to travel back in time to the late 1990s, the vision involved using an “answering machine” for data conferences. In this example, the answering machine addressed an issue where a user who wanted to establish a data conference with another user was unable to connect due to various reasons such as the other user being away from the workstation. Rather than hanging and then using a different means of contacting the other person such as email or voicemail, this answering machine allowed the caller to leave a message directly. 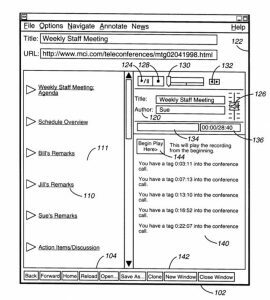 This particular invention used a new architecture and method to manage teleconferences by including a recording system where participants could set a mark to begin recording and then later play the audio back from that mark forward. It blend telephone connections with Internet or intranet networks. Participants could access their recordings using a standard touch-tone telephone or a desktop computer with the appropriate software. This early conference call recording system allowed participants to either record the entire call or just portions of it. The patent for this invention was issued to Timothy Culver and Randall Oakes of MCI Communications in 1998. The illustration below illustrates how the starting and stopping of the recording might be used in practice. Here we see a conferencing system that is beginning to look like a modern system complete with a chat box and the ability to transfer files. In fact, this invention included attendant, presenter, and chairman terminals. This invention authenticated each participant, verifying identity. In short, each user’s identifying personal data would be presented to the chairman’s terminal, allowing for authentication. Obviously, technology has changed dramatically since the 1990s and early 2000s. However, when participating in a modern conference call, you’ll likely see remnants of these earlier ideas plus a host of other innovations designed to ensure secure, high quality conference calls whether via telephone or over the Internet. “A Brief History of Conference Calling | WHYPAY?” 2017. 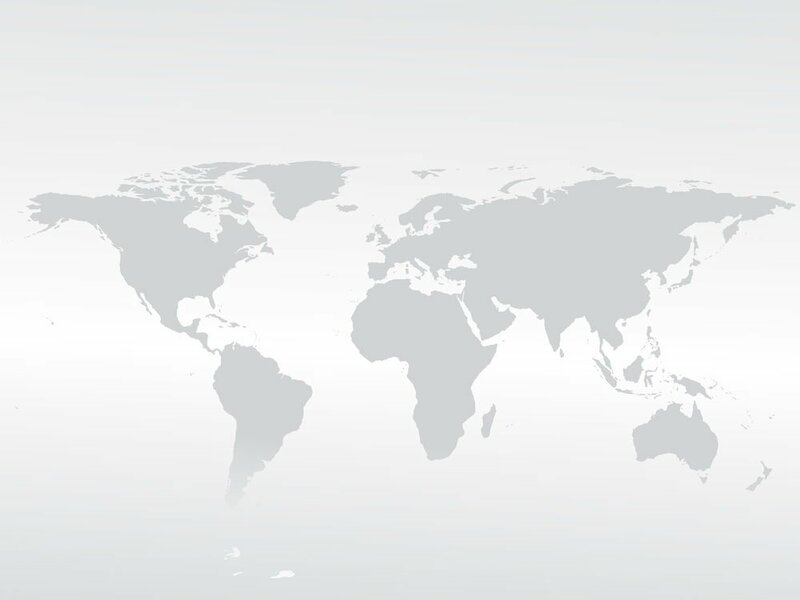 Accessed August 14. https://whypay.net/a-brief-history-of-conference-calling/. “Result – Google Patents.” 2017. Accessed August 14. https://patents.google.com/patent/US5778053A/en?q=answering+machine. “Steadfast Telecommunications – A Brief History of the Conference Bridge.” 2017. Accessed August 14. https://steadfasttelecom.com/brief-history-conference-bridge/. “This 1915 Conference Call Made History | Computerworld.” 2017. Accessed August 14. http://www.computerworld.com/article/2874390/this-1915-conference-call-made-history.html. “US6298129B1 – Google Patents.” 2017. Accessed August 14. https://patents.google.com/patent/US6298129B1/en?q=teleconference&q=audio&q=recording.